Continuing with the Robert Oster inks I've been reviewing lately, today is Robert Oster Ng Special 16. As soon as I swatched it, it immediately reminded me of Robert Oster Peach, which I love, so let's take a look at it. I purchased my sample of ink from Vanness Pens. Ng Special 16 is a bright, light orange with shading. The ink drops show off the ink's shading-it ranges from a nice light orange to a dark pumpkin color. Let's take a look at how the ink behaves on nice paper first. 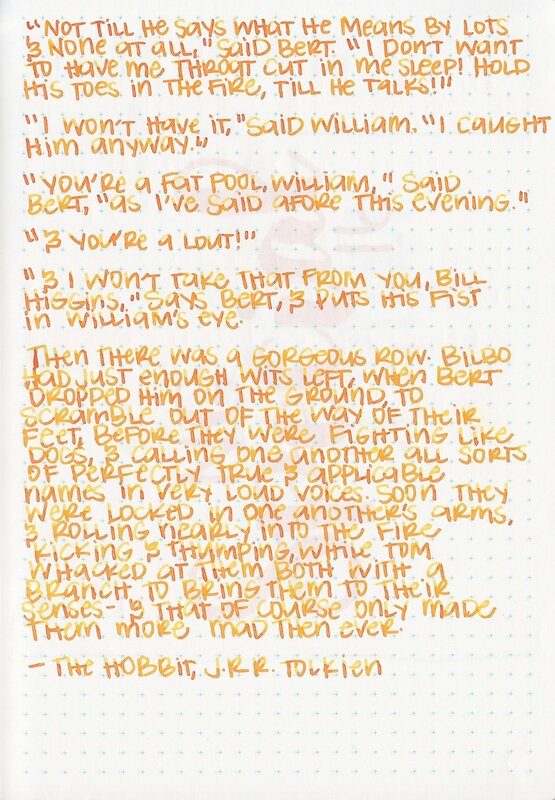 On Moleskine paper, which is not known for being fountain pen friendly, there was a tiny bit of feathering, and some bleeding. The ink did ok, but it's not one I would recommend for cheap paper. 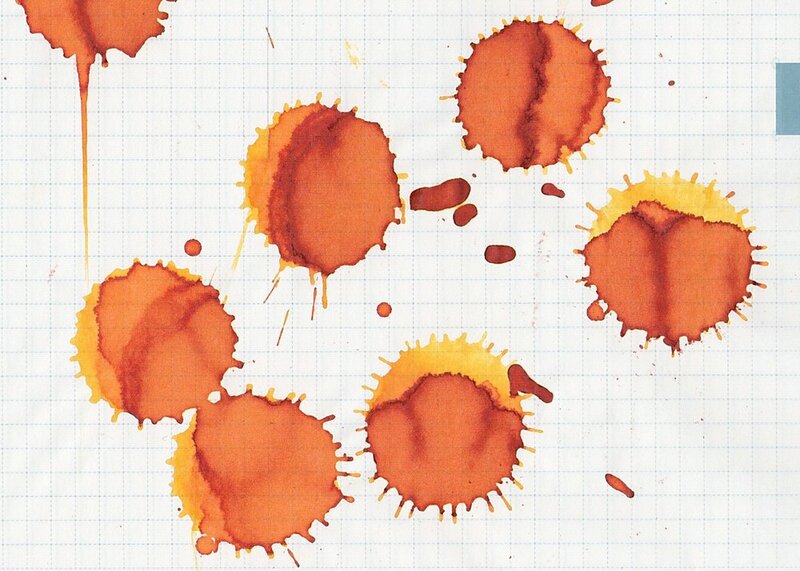 Ink swabs for comparison, left to right (top to bottom for RSS): Robert Oster Peach, Robert Oster Ng Special 16, and Robert Oster Orange. Click here to see the Robert Oster inks together. Ng Special 16 feels like a darker version of Peach to me, which is great because I love Peach. Papier Plume Sazerac, Pilot Iroshizuku Yu-yake, and Robert Oster Tangerine. Sazerac is similar to Ng Special 16, but Ng is a bit brighter. Click here to see the orange inks together. I used a broad Pilot Vanishing Point on Tomoe River paper, and I really loved the combo. The ink was just a little bit wet and had a nice flow. Overall, I really like this ink. It has some great shading, and is nice and bright. This one is going on my list of inks I need a full bottle of.